Today we’re going to have a look at an insanely-spec’ed memory kit, G.Skill’s high frequency, 2×4 GB DDR3-2933 TridentX kit. 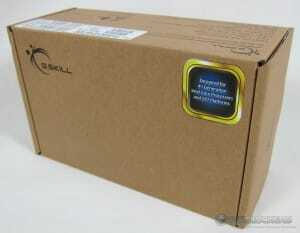 It is designed for one thing – hitting extremely high frequencies on the Intel Haswell platform. Of course, people looking to buy such a kit want to know how it performs too, so we’ll look at that for you as well. 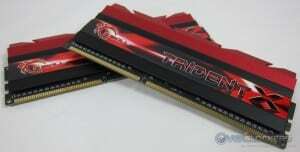 This kit is rated for DDR3-2933 with loose(r) timings of 12-14-14-35-2N. However, it’s one of those crazy kits that can do that kind of frequency at only 1.65 V, which is impressive in itself. 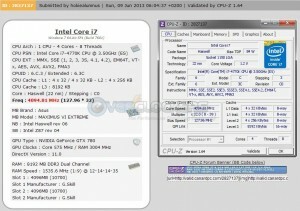 The specifications were pulled from G.Skill’s product page. Like all high-performance G.Skill memory that comes with a fan, the packaging is a rather nondescript cardboard box with a sticker for the memory specs and one denoting for which chipset the kit was designed. While they always put that sticker on there, remember that they will work just as well on any platform, but other platforms may not be able to run them to spec – especially ones rated for this kind of frequency. 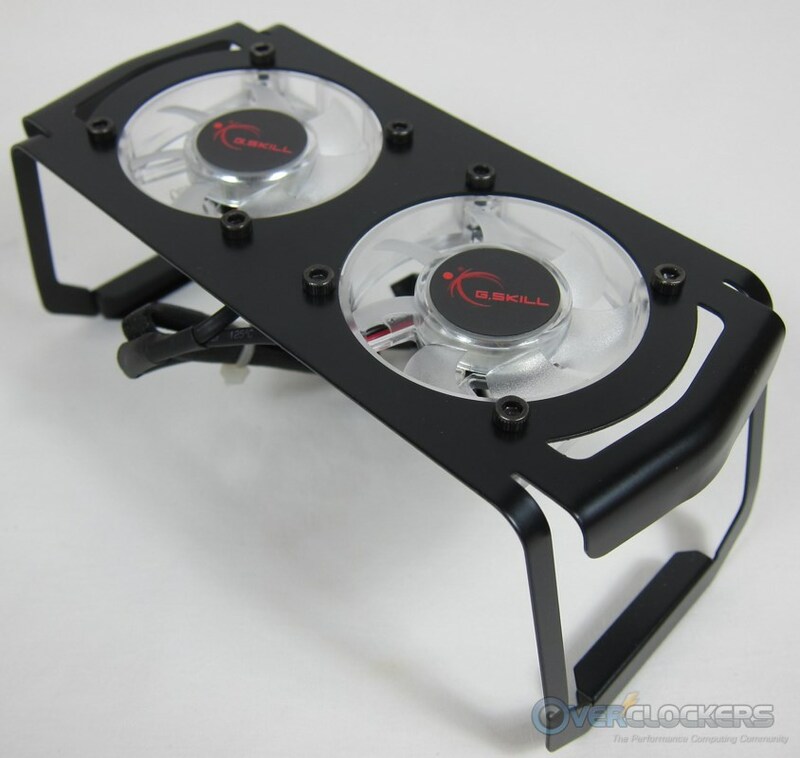 The included fan is your standard G.Skill fare, with two 50 mm fans mounted into a metal cage. 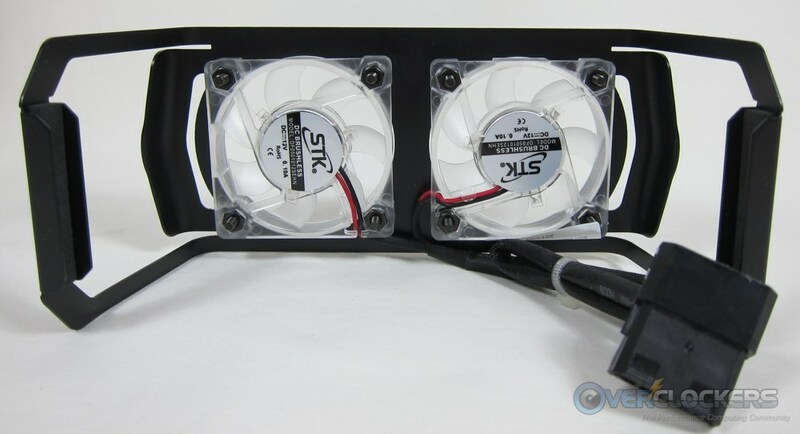 I wish they’d ditch the MOLEX connector and go for a 3-pin fan header so you could plug it right into the motherboard. That would help with wire management. Here are the sticks themselves, which are the tried and true TridentX heatspreader design. That top fin does come off if you have an air cooler that extends a bit too far over your memory slots. These are different than past kits in that they’re single-sided 4 GB modules. While I’ve agreed not to pull the heatspreaders off of G.Skill RAM and photograph the ICs, if you know anything about high frequency, single-sided RAM from any manufacturer, you’ll know right off the bat these are Hynix MFR ICs. What’s that? You want a few more photos? Ok! Good looks and very high frequency; so far so good! 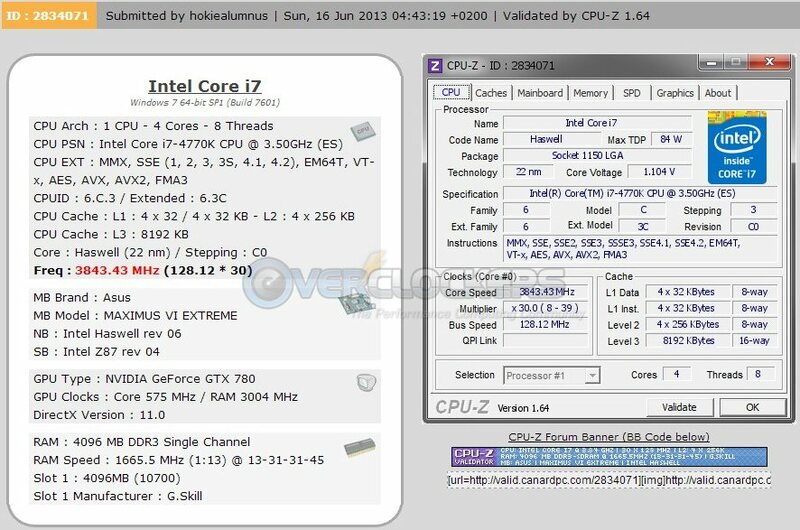 Our test system is a Haswell-based machine using an i7 4770K and a very strong memory clocking board, the ASUS Maximus VI Extreme. 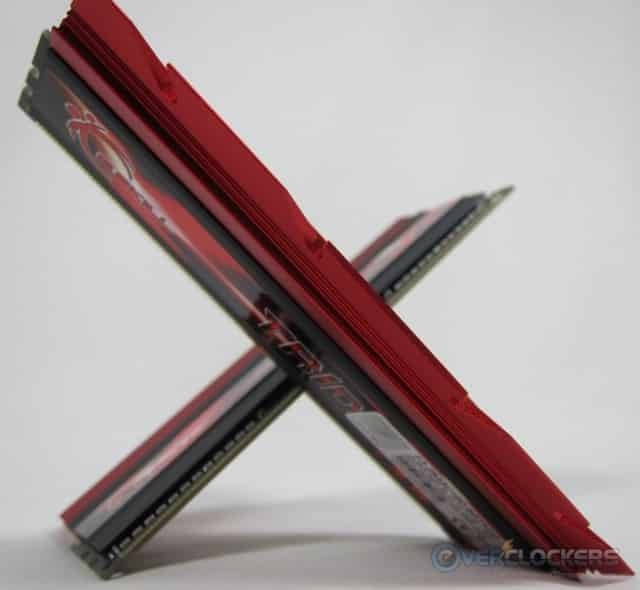 The ROG red and black sure pairs well with TridentX sticks. The first thing we need to do is make sure these sticks work as advertised. I put the CPU at stock, set the XMP profile, set VCCSA (System Agent Voltage) at 1.25 V and booted into our tester kindly provided by UltraX, the UltraX R.S.T. Pro. In this case, our PCIe tester was down so I used the conveniently supplied USB tester. Both of them perform the same intense testing. As you can see, five passes passed over four hours of hammering on the RAM. The sticks were nice and toasty when finished, even with a fan blowing over them. Of course, we’d be remiss if we didn’t test in-OS too. The kit passed HyperPi 32M testing without complaint. With stability out of the way, let’s see how this kit performs. First, the methodology. All benchmarks here on both of the kits tested were run three times with the results averaged. There is a third set of results that were run once. This kit was underclocked and the primary timings were tightened to see how much of a difference it would make. They did so admirably, running at DDR3-2800 with timings of 11-13-12-28. The rest of the timings remained at XMP. All results are graphed relative to this kit’s performance. 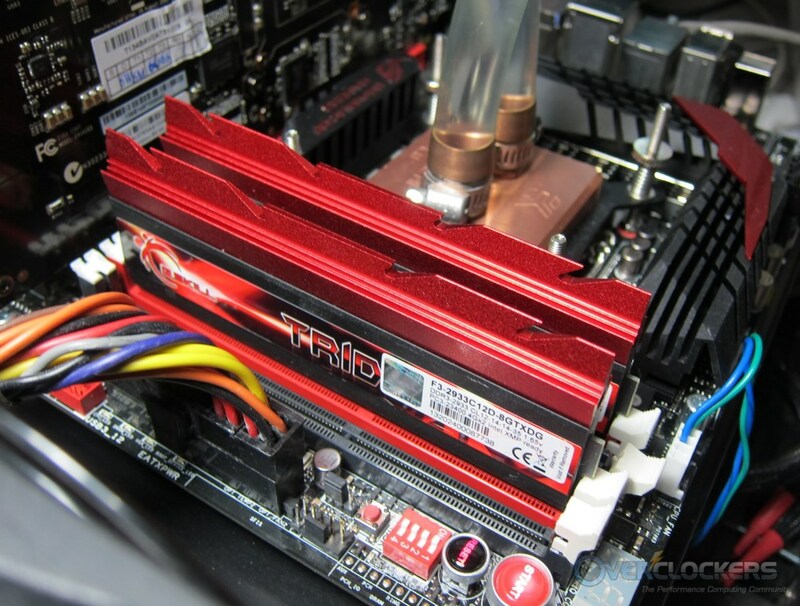 The DDR3-2933 TridentX kit is always 100% and the other tested configurations go over or under that, depending on whether they perform better or worse, respectively. Now we’re where the rubber meets the road and when I got this kit, the extremely high frequency actually worried me, as it should be worrying those of you that care about more than RAM frequency. Timings are almost always sacrificed when raising frequency. Often the main four timings aren’t the only thing sacrificed; secondary and tertiary timings invisible to the end-user (when running XMP) also play a role. Indeed that was the case here. When graphing the results I noticed that in many cases, this kit was out-performed by the much less expensive DDR3-2600 TridentX kit. So I wanted to see if lowering the speed and cranking down the timings would help. 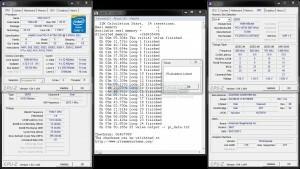 Thus, I lowered the speed to DDR3-2800 and was able to lower the four main timings as noted. I left the rest of the kit running at XMP. At that speed & timings, the results should have gotten close to mirroring the DDR3-2600 kit, and in some places it did, but for the most part the DDR3-2600 kit won out again. The only reasonable explanation is that the secondary and tertiary timing sacrifices necessary to run this kit at such high speed were too much to help performance. You can peruse the benchmarks yourself and I won’t put too much text in between them. 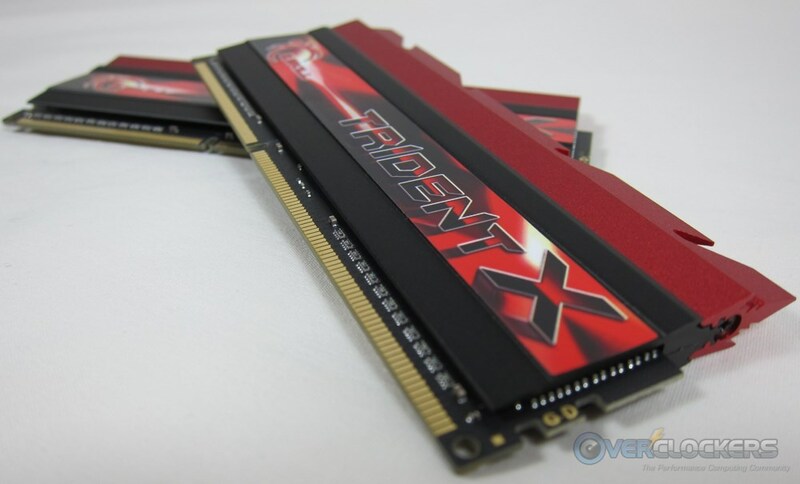 The takeaway is that this kit is out-performed by a cheaper TridentX DDR3-2600 kit. AIDA is going to show the largest difference between the competing kits; synthetic tests always do. 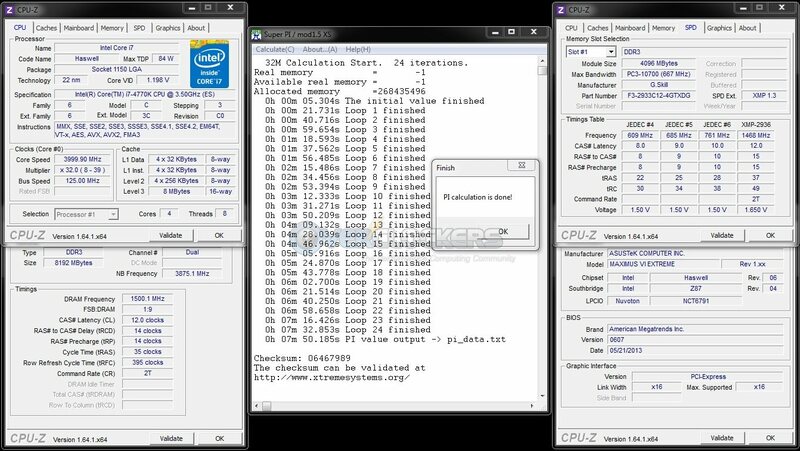 Here you can see the DDR3-2933 results just get trounced across the board, especially in write & copy speeds. reducing the speed & tightening the timings did help a lot though. Real world tests always show very little variation between RAM speeds. Where you’ll see the biggest difference between kits of memory are in synthetic testing and SuperPi benchmarking. Thus, there is a very small difference between these kits here. 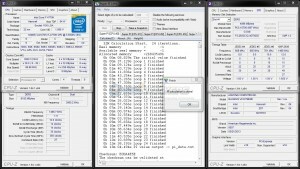 However, in four out of the six tests run, the DDR3-2600 kit comes out ahead. It’s only slightly ahead, but it was a consistent increase over the DDR3-2933 kit, with the exceptions of Cinebench R10 and PoV Ray 3.7. Last but not least, we’ll check out SuperPi and WPrime for the benchmarking crowd. 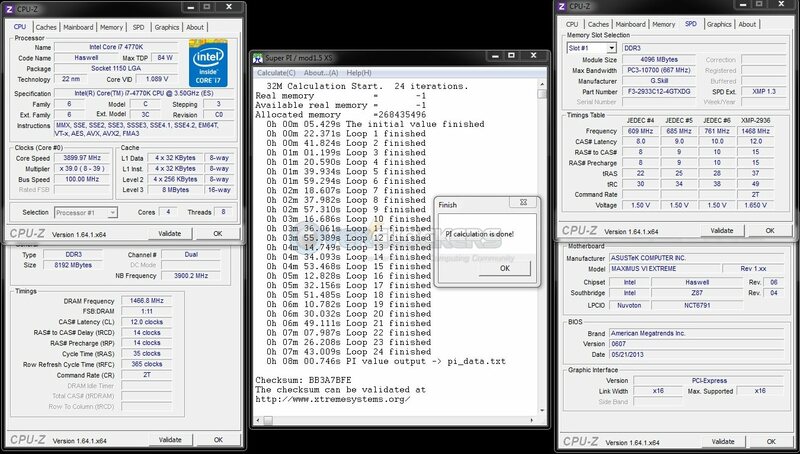 With the exception of WPrime 1024M, which showed the DDR3-2933 kit just ediging out the DDR3-2600 kit, the latter kit wins the benchmarking brawl. The most important metric here by far is SuperPi 32M and the DDR3-2933 kit lost by nearly five seconds, which is big in the benchmarking realm. So performance is not necessarily this kit’s bag. I emailed G.Skill with my results and basically gave them nearly the same conclusion I’ll be giving you here. They would agree that this kit’s purpose isn’t to necessarily perform better – it’s to have FUN with when overclocking memory. The first thing I did was see if it could run DDR3-3000 without issue. Indeed it did, no problem. No effort, no voltage changes, just bumping up. SuperPi 32M took a little more voltage to stabilize at DDR3-3000, but it did with 1.7 V applied to the RAM. Not too bad so far. Then I started working the kit for what it’s made for – raw frequency. Before figuring out how to really clock RAM and with two sticks in, the kit seemed to stop at DDR3-3071 at 1.75 V.
So I went to work on actually clocking the RAM. First I pulled one of the sticks and went with a single stick in DIMM 1 on the board (the one closest to the CPU socket). Then I quit being a wuss and threw 1.85 V (in gradual increments) at it. 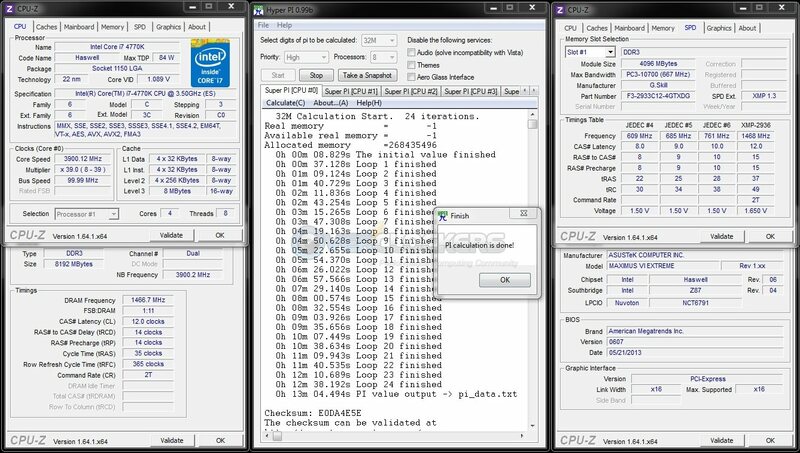 That was how, with a little trial and error, I was able to clock this kit to a phenomenal DDR3-3330 with the CPU on water and the memory on air. Let me say that again – this is air cooled memory reaching DDR3-3330. Wow. For those that like more proof, here’s the validation. As usual, bleeding edge, high frequency memory isn’t cheap. Thankfully memory prices have dropped a little bit recently and the 8 GB G.Skill TridentX DDR3-2933 kit has come down to $369.99 shipped at Newegg. To state the obvious, that is a lot of money for a kit of memory. It’s not as much as some DDR3-3000 kits on the market – G.Skill’s is $799.99 and Corsair’s is $749.99 but out of stock. Performance has been the elephant in the room in this review, so let’s drag that elephant right out front & center (as if you couldn’t see it before). This kit is out-performed by its little brother. 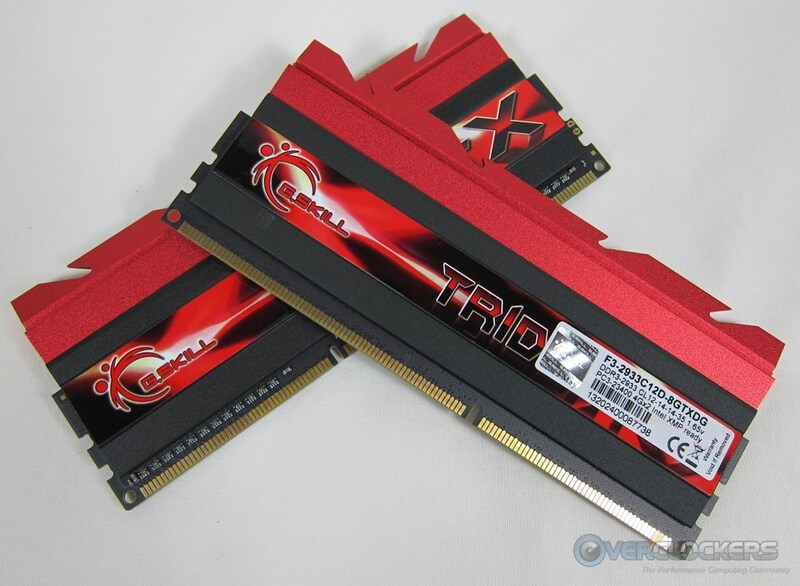 The 8 GB G.Skill TridentX DDR3-2600 kit used for comparison here is $139.99 on Newegg. That’s 37.8% of the price of this DDR3-2933 kit. Not nearly 40% less than the price of the kit being reviewed, it’s under 40% of its price. Oh, and it performs better. So for anyone out there that wants memory currently on the market for performance, go for that kit. 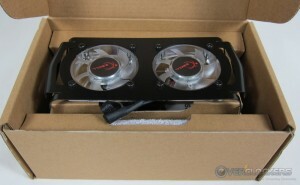 G.Skill will be happy; they’ll still be getting your money, just not as much of it. That’s not the whole story though. For a subset of a subset of overclockers that really enjoy memory overclocking (of which yours truly is one), this kit is tailor made for you. If you find yourself in that subset that is willing to spend a good sum of money purely for the fun of overclocking your memory to DDR3-3000 and beyond – well beyond – this kit has your name written all over it. Believe me it is A. Lot. Of. Fun. Fun in spades. This is a memory geek’s dream at half the price of those DDR3-3000 kits. For the rest of you, those that value performance over frequency numbers, have a look at the frequencies this kit can achieve. Then say “Ooohh” and “Aaaahhh”. Then go buy a cheaper kit. Because this kit does what it says it will do and it can overclock to the moon – with regard to frequency only – as designed, I will not give it a “meh.” However, because it fails to do the one thing that higher-priced, higher-spec’ed memory should do – out-perform its cheaper-by-a-long-shot little brother – it doesn’t get to be Overclockers Approved either. Sorry G.Skill – and all the other manufacturers putting out these crazy high frequency Hynix MFR kits like Corsair, Avexir, Adata, etc – you’ve got to bring the performance to go with the MHz. Without it, your kit is dead in the water aside from those that are either really into memory overclocking (see: subset of a subset) or those that are compensating for something else. What were the timings on the 2600 kit? Per XMP. The primary four are 10-12-12-31. But yeah, why is high MHZ RAM like this so pointless? What makes it that way, that increasing system memory clocks yields such low performance gains? It takes much more time to compute things than it takes to get the data to compute from RAM. Hence, RAM is not the bottleneck. Hence, Widening the RAM pathway doesn't do much. So CPUs are the bottleneck, gotcha. Why is memory tech so far ahead of everything else? Like those tiny 64GB micro SD cards... Stuff is amazing. To an extent, the bigger the CPU cache the less memory speed matters. We have quite large caches now, so memory doesn't matter much. If you could disable the L3 cache suddenly memory would matter a lot more. 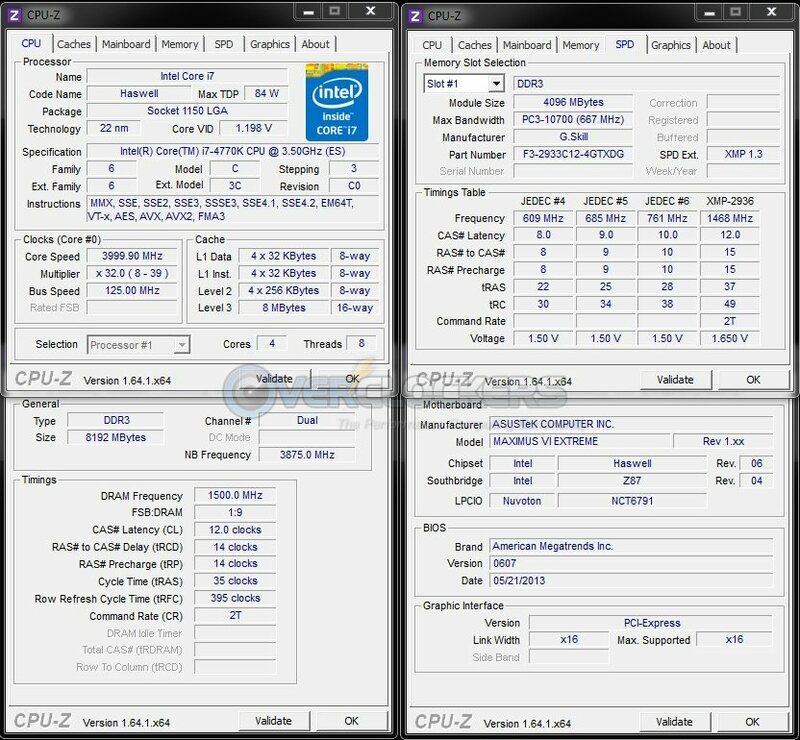 This could actually be tested to an extent, Athlon II quad core vs PhII quad core, especially an early AthII that was simply a PhII with disabled L3. Sadly, I don't have one. 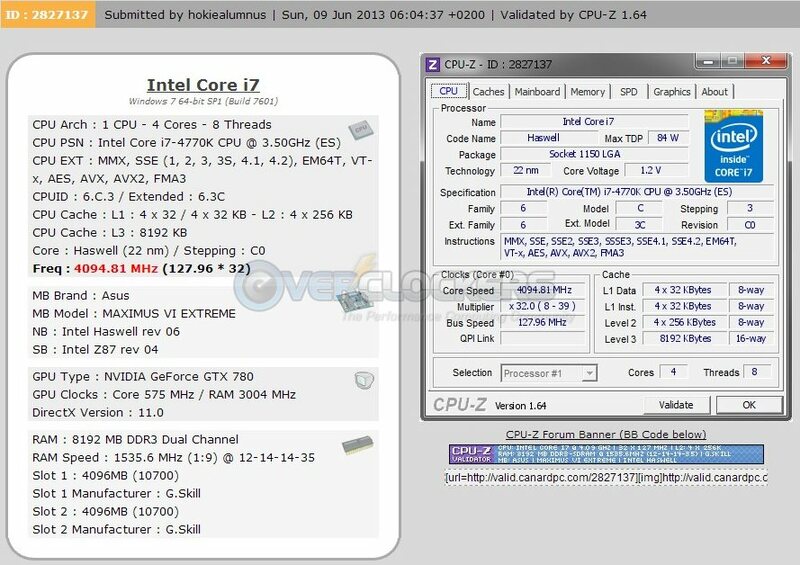 To see full performance of most 2600+ kits on haswell you need 5GHz+ CPU if not higher and even then real daily performance won't change much. More important seem good timing balance than tightening everything at all cost. 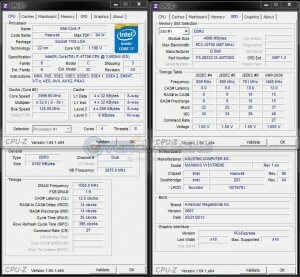 You can actually set 2400 kit with well programmed SPD/XMP as fast as most these 2800-2933. I had no chance to play with 2933 MFR kits but TridentX looks like one of the best available around for high clocks. I was kind of curious: did you try this kit with lower frequency like 2133 or 1866MHz and tighten the timings as far as possible? Better Hynix MFR kits can usually make 1866 9-10-10 , 2133 9-11-11, 2400 10-12-12 on ~1.60-1.65V but all depends from IC. Since these TridentX are one of the best available then I think it can probably run at slightly tighter timings. Btw, could you guys explain me why so much focus is put on reducing tCAS whatever it takes (ie. increasing sometimes drastically other timings)? The average read latency should be somewhere between tCAS if the page is active and tCAS+tRP+tRCD (worst case) if I need to close the page before opening an other. The point is: if I want to see difference in overall read latency between two sticks of RAM, it would be when all the RAM is used, where page-miss occurs more often, increasing the latency. So if I am more in the case where the latency is tCAS+tRP+tRCD instead of tCAS, what is the point of reducing tCAS by one cycle (from 10 to 9 for instance) and increasing by one cycle tRP AND tRCD? I think you may be over-complicating it, at least from a practical standpoint. Any reduction in timings, in theory, reduces latency, regardless of which one. One problem is that RAM now-a-days, generally speaking, hates tighter tRP. You can usually take tCL down at least one and tRCD can usually be reduced one to three'ish. On the other hand, tRP on most modern Hynix & Samsung chips strongly dislikes being reduced. So that's pretty much why the focus on the other two....because tRP is often incapable of tightening. At least from a user adjustment standpoint. If you're referring to why manufacturers focus mostly on tCL, that's easy. They're binning to make the chips do the best timings they can with stability to make them look good. When looking at RAM, most people (rightly) consider tCL to be the most important timing. It does have the most impact on performance. Tightening the others and giving up some on tCL generally hurts more than it helps, so that's why you see most kits with a tighter tCL and slightly looser tRP & tRCD. One problem is that RAM now-a-days, generally speaking, hates tighter tRP. Sorry but, i think that raw MHz is no use to the daily user of real stuff such as games and not only synthetic benches. 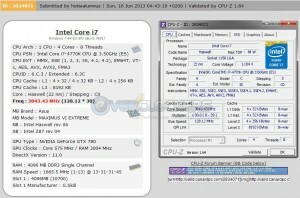 Best RAM is usualy the one with best balance between timing and MHz. In the budget range, a 1600/9 9 9 24 kit (8 GB DIMM available) is unbeatable. If someone isnt happy using standart specs and is willing to pay more, then a 2400/ 9 11 11 31 kit (4 GB DIMM only) would be awesome too and overall surely better performing but i truly see no use for MHz (above 2400) or even timing (below CL 9) beyond that level as long as either timing or MHz is unable to achieve a good balance. So, from the common sense view, that kind cant be recommended (sorry, yes even if we are a overclocker community) but of course just for benching or raw enthusiasm purpose... why not. But definitely there is no practical use for "daily "programs and tasks. On top of that, i have to say, that a volt number of 1.65 isnt the best bet on a CPU controller (designed for 1.5 V) for 24/7 use and may definitely decrease lifetime. I usualy go with 1.5 V memory, more safe to the CPU controller and i wont even notice the difference in RAM peformance for almost any of my tasks. In term someone want to be stick with 1.5 V, then the best bet would be a 1866/ 8 9 9 24 kit (4 GB DIMM only) but more expensive than a 1600 kit. Another issue is the size of the sink, when i build small factor PCs, i usualy have coolers with very problematic size around the CPU and sink higher than 40 mm are usualy a issue to me. So, i dont necessarely need low profile but highest possible is "medium profile" such as the one from Ripjaws Z-Series. Most "super high peformance RAMs", either got to huge sinks, bad balance between timing and MHz, bad price/performance ratio and minor performance improvement for daily use or even multiple issues at once. So all in all... just rarely and barely worth it. For a subset of a subset of overclockers that really enjoy memory overclocking (of which yours truly is one), this kit is tailor made for you. If you find yourself in that subset that is willing to spend a good sum of money purely for the fun of overclocking your memory to DDR3-3000 and beyond – well beyond – this kit has your name written all over it. Believe me it is A. Lot. Of. Fun. Fun in spades. This is a memory geek’s dream at half the price of those DDR3-3000 kits. As far as the heatsinks, as noted in the review, that top red fin is removable so your comment there is moot. Ok yes true, i just say in general. But Overclockers wasnt recommending it thats indeed true. About the sink, in term its able to achieve medium size (when head is removed) then its usualy fine (medium = 40 mm/1.58 inch module height or less). Then i would accept that my comment is moot, but just for that review and not for "general". 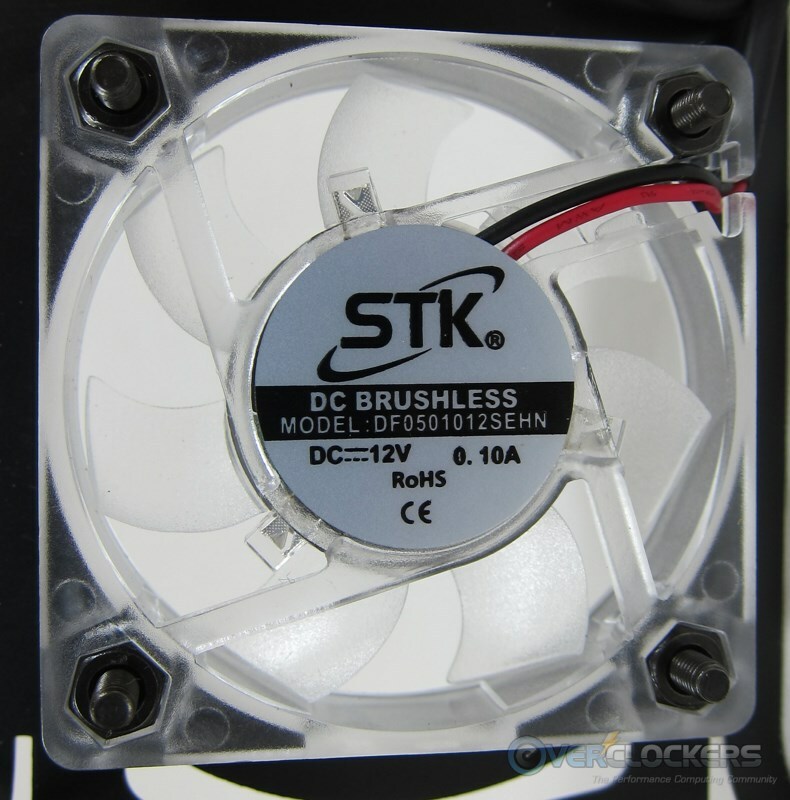 "Small" size is basically almost same size such as the PCB where the chips are stored (up to 10 mm lesser than medium size) but not a requirement for most high end coolers. Most of them are tuned in order to allow 40 mm, as far as i can see. Anyway, yes in term its not above 40 mm when head removed its fine regarding that matter. As far as i can see on the picture, using my "sense of proportion" the removal of the head will cut the difference to the top of the PCB by a bit more than half. The total size is 54 mm, the difference to the PCB is about 24 mm, when head removed we may have around 40 mm (54-14 mm), so it may fit the medium range.